For your holidays in Orosei, on the Italian island of Sardinia, Camping Cala Ginepro offers a wealth of both services and facilities. In the wonderful natural environment in which the campsite is immersed, you can choose from a multitude of different offerings – many are free, some are subject to charge and others are available on demand. You can use the free Wi-Fi in the bar area. The campsite is equipped with hot showers and changing tables for very young children. Moreover, every pitch includes access to a nearby power supply, and there are even barbecues for when you want to grill some great food outdoors. You can also hire windsurfing equipment, canoes and mountain bikes, and you can reserve a slot on the sports pitch. You can book an excursion that we will put together for you in partnership with our network of local professional guides. The Restaurant / Pizzeria, the Market, the Newsagent and Reception are always at your service! And if you’re staying in our mobile homes, your accommodation includes a weekly linen change, along with a parasol and two sun loungers on the beach reserved for you. 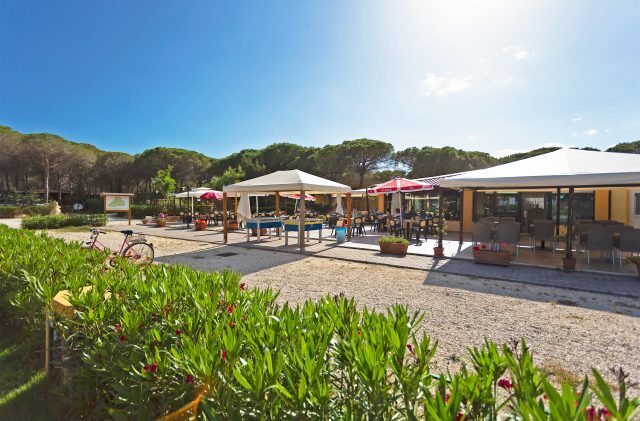 Whether you’re visiting as a family, as a couple, on your own or with friends, the services and facilities at Camping Cala Ginepro will make your holidays in Orosei all the more enjoyable. We look forward to seeing you for unforgettable days filled with relaxation and fun, immersed in the untainted environment of Cala Ginepro, which is ideal even for young children. We are ready, willing and able to offer you all the support you need both before and during your stay. At Camping Cala Ginepro, your holidays in Orosei become special. Click on the icons and discover the services and facilities designed with you in mind!